Accept the challenge of the contemporary world, and of the world at all times, by living the mystery of your [contemplative religious] state, more radically than ever. This is madness to the eyes of the world and wisdom in the Holy Spirit: the exclusive love of Christ and of all our fellow men in Him. Regular observance, adopted by St. Dominic from tradition or newly created by him, fosters the way of life of the nuns by helping them in their determination to follow Christ more closely and enabling them to live more effectively their contemplative life in the Order of Preachers. Mindful of the first nuns whom the blessed Dominic established in the monastery of Prouille at the heart of the “Holy Preaching,” the nuns, while living together in harmony, follow Jesus as He withdraws into solitude to pray. In this way they are a sign of that blessed city Jerusalem which the brethren build up by their preaching. 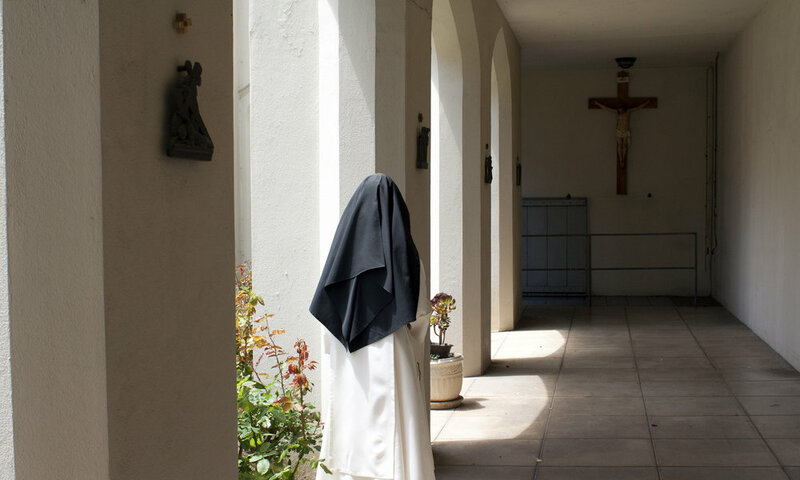 In the cloister the nuns devote themselves totally to God and perpetuate that singular gift which the blessed Father had of bearing sinners, the down-trodden and the afflicted in the inmost sanctuary of his compassion. To regular observance belong all the elements that constitute our Dominican life and order it through a common discipline. Outstanding among these elements are a) Common Life and Community, b) Prayer (the celebration of the liturgy and personal prayer), c) Study of Sacred Truth, and d) Preaching (first and foremost through faithful observance of the vows). To fulfill these elements faithfully, we are helped by 1) Enclosure, 2) Silence, 3) the Cell, 4) the Table, 5) the Habit, 6) Work, 7) Penitential Practices, and 8) Regular Chapter. The nuns devote a total of at least two hours each day to personal (mental) prayer, which includes a time of vigil prayer before Matins or after Compline, a daily holy hour before the Blessed Sacrament, and a half hour of lectio divina. Additionally, times of profound silence (afternoon hour and the night hours) are particularly reserved for additional prayer, study, and needed rest. ON ENCLOSURE: By withdrawal from the world, in fact and in spirit, Dominican nuns, like prudent virgins waiting for their Lord, are freed from worldly affairs so that we may have leisure to devote ourselves wholeheartedly to the kingdom of God. This hidden life is aimed at opening our minds to the breadth and height and depth of the love of God who sent His Son so that the whole world might be saved through Him. Such was the enclosure chosen for the nuns by our holy Father Dominic from the beginning of the Order of Preachers and faithfully observed until now. 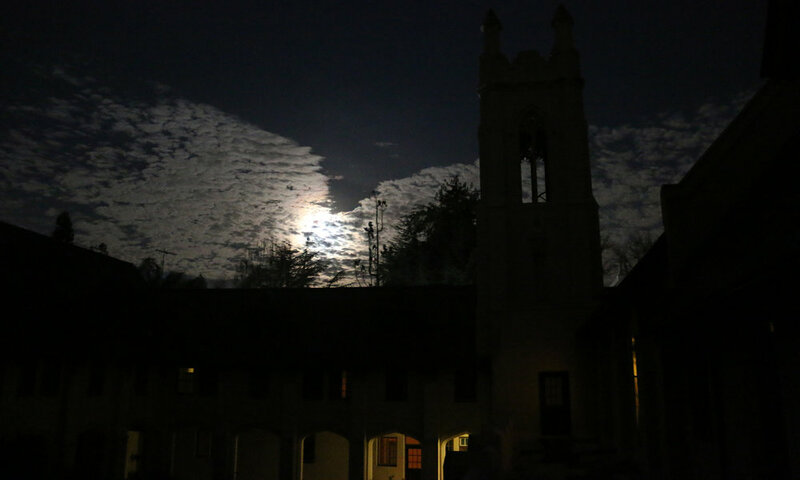 ON THE EARLY RISING: "The first sound of the bell calling the religious to rise to prayer is the first voice of obedience... 'Rise, my daughter; the hour of prayer has come.'" ON STUDY: "Study is not the end of our Order, but is extremely necessary to secure its twofold end, namely, preaching and the salvation of souls. For without study, neither can be achieved." 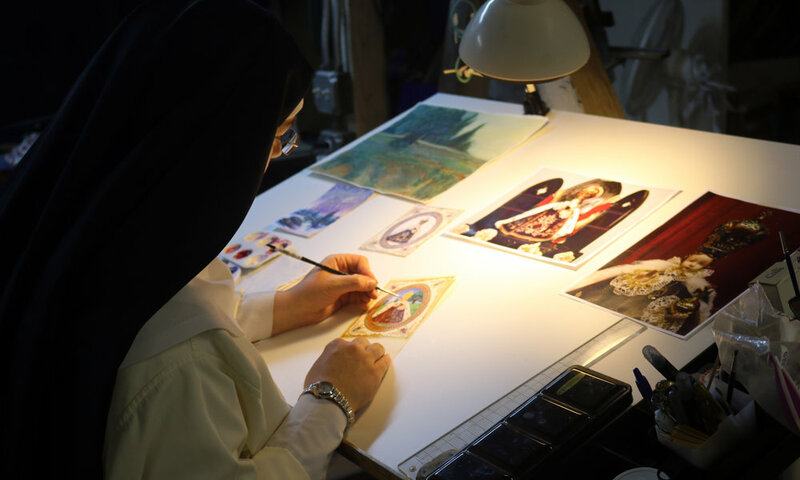 ON WORK: Rejoicing that they can fulfill the design of the Creator and be associated with the work of the Redeemer, the nuns should readily give themselves to work, with all their powers of mind and heart as well as their gifts of nature and grace. MORE ON WORK: Since in the life of the nuns, work is subordinated to contemplation, this manifests a right ordering of values among earthly activities, according to the spirit of the Beatitudes. ON THE HABIT: The habit of the nuns is a sign of their consecration and a witness to poverty. It consists of a white tunic, a belt with a rosary, a white scapular and a black veil and cappa. ON DOMINICAN DEVOTION TO THE HOLY NAME OF JESUS: "Lord, I beseech Thee..imprint Thyself deep down into my very inmost heart, and so inscribe Thy Holy Name in me, that Thou may never more depart from my heart." - Bl. Henry Suso, O.P. ON THE MONASTIC CELL: The monastic cell is not only a place for rest, but like an enclosure within the enclosure, it is a closed room for prayer in secret, a place for lectio divina, meditation, study or individual work. Each cell is supplied with necessary furnishings, while still savoring religious poverty. ON THE CHAPTER: "When our Holy Father Dominic was leading the devil through all the different rooms of the convent, compelling him to tell his snares and devices against the souls of the Brethren, it is said that the evil one showed an extreme aversion to entering the chapter room, and, being asked the cause, replied: 'Because what I gain elsewhere I lose in this place, by the humble confession which the Brethren here make of their faults." ON THE DIVINE OFFICE: "The Divine Office, by which we offer to God, in the name of the Church, the praises due to Him, is, after the Holy Mass, the most significant act of the Christian religion." -Bl. Hyacinthe-Marie Cormier, O.P. ON SACRIFICE AND PENITENTIAL PRACTICES: By reason of our religious consecration and the apostolic vocation of the Order, the nuns are urged more than the rest of the faithful to deny ourselves, take up our cross, and bear the death of Jesus in body and soul for the salvation of souls. In imitation of St. Dominic “who while he lived in the flesh walked in the spirit, not merely refusing to satisfy the desires of the flesh, but extinguishing them,” the nuns strive to exercise the virtue of penance especially by faithfully fulfilling everything that pertains to their life. We hold in high esteem the very ancient tradition of fasting and abstinence, while knowing that the fast acceptable to God consists rather in conversion and humility of heart. We rejoice to deprive ourselves in order to share our bread with the hungry and less fortunate. Our other principal penances include certain exercises of piety, certain forms of mortification, works of mercy, and works otherwise useful to the community. The nuns also consider the various circumstances of places and persons and so individual monastic communities may adopt new forms of penance accommodated to the contemporary manner of local living. ON DOMINICAN DEVOTION TO THE SOULS IN PURGATORY: "Be a Dominican when you die." - Italian proverb, referring partly to the often happy deaths of Dominicans and partly to the great number of prayers for the faithful departed offered by Dominicans. ON SILENCE: The blessed Dominic “rarely spoke except with God in prayer, or about God, and he exhorted the brethren to do likewise.” Pondering this in our hearts, we make of our house, and especially of our hearts, a place of silence. It is the guardian of all observance and a particular aid to peace and contemplation.